Need more than 10 kits? Call 800.277.3727 for special pricing! Search and Rescue Backpack filled with essential supplies needed during a search and rescue operation following a major disaster. The spacious, multi-pocket, neon orange backpack has high-visibility and can accommodate additional items of your choosing. Comprehensive kit contains not only items to perform search and rescue but also food, water and shelter to remain active in the field for up to 72-hours. 2400 Calorie Emergency Food Bar contains no nuts or coconuts, provides 100% of the daily required vitamins and minerals for an adult and comes packaged in a resealable pouch to maintain freshness. Designed to store in a vehicle, tested to withstand extreme temperature fluctuations ranging from -22°F to 149°F. First aid items including a Thermal Mylar Blanket for sheltering-in-place or treating shock victims. Heavy-duty crowbar to aid in removing debris. 50’ rope holds up to 400 lbs. Highly visible blaze orange, military-grade backpack constructed out of heavy-duty, water resistant nylon. 4 point Ratchet/Pin Lock Hard Hat meets OSHA requirements and ANSI Z89.1 Type 1, Class C, G and E Standards. Call 800.277.3727 to orders quantities over 10. 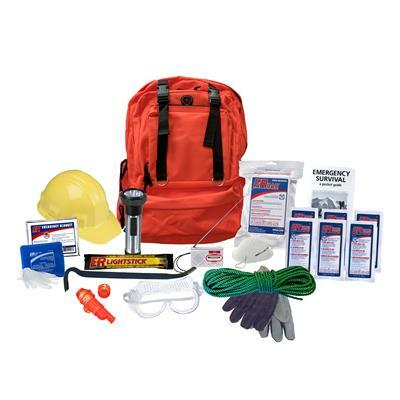 This one-person search and rescue kit contains the necessary supplies needed to perform search and rescue missions for up to 72-hours. Includes a three-day supply of food and water, emergency blanket, first aid items, lighting, AM/FM radio, 5 in 1 survival whistle and personal protection items including hard hat, gloves, goggles and N95 dust mask. Packaged in a military-grade neon orange backpack constructed out of water resistant nylon.